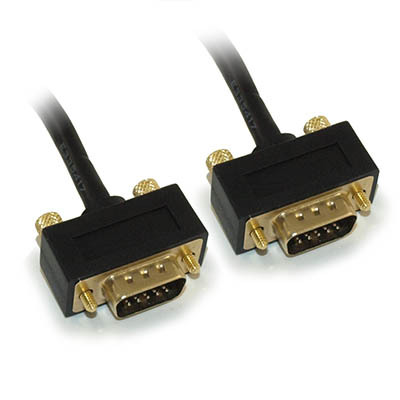 High Performance UltraThin VGA HD15 Male to Male Triple Shielded Cable with Interchangeable Mounting. 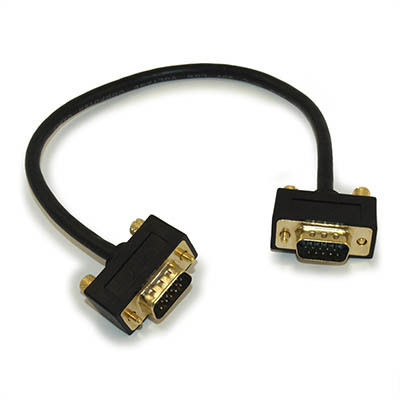 Connects any VGA video to any computer, switch or splitter with HD15 female port. Supports all VGA monitors including analog flat panel display, high resolution desktop, CAD and graphic workstations. Its UltraThin diameter provides space-saving design and flexibility not found on regular VGA cables. Interchangeable mounting allows you to replace the thumbscrews with included stand-off screws and can be mounted on a face plate. Unlike other thin VGA cable, this high performance cable goes up to 100ft without signal booster, and triple shielding for maximum graphics performance, prevents signal loss, screen ghosting & loss of color. cables are UL listed, have matched impedance, PVC jacket, molded ends with thumbscrews and inner hood soldered 360 degrees to the connector for complete end to end shielding.